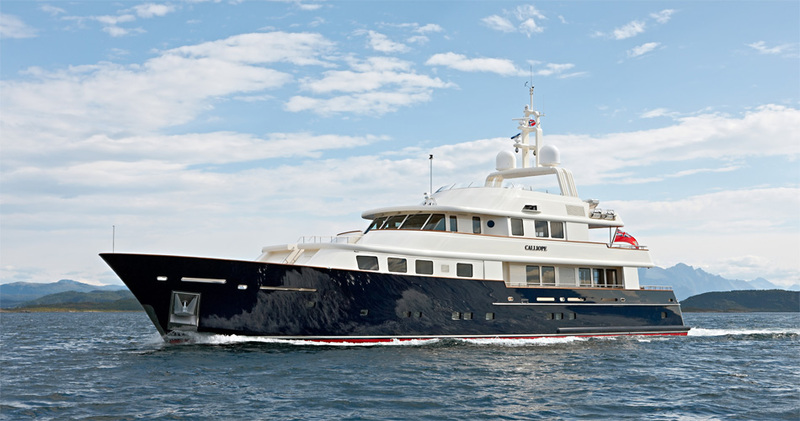 NEWPORT, R.I. (May 12th, 2011) – Rhode Island-based Langan Design Partners is delighted to announce that Calliope, the latest motor yacht from the office’s drawing boards, has won the World Super Yacht Award for the best Three-Deck Semi-Displacement or Planing Motor Yacht. This award comes as a fitting tribute to the company’s founder, the late Bill Langan of Jamestown, R.I., who led the design of this project from its initial conceptual phase in 2006 all the way to her launch in early summer of 2010. Bill passed away in late 2010 following a two year battle with Leukemia. Designed for a longstanding client this motor yacht can take her owner and eight guests to the most remote regions of the planet. Powered by two diesel engines delivering almost two thousand horsepower each, she has a top speed of 16.5 knots and a range of 1900 nautical miles. The classic and airy interior was designed by the Rhoades Young office of Lymington, England. The interior decoration and soft goods are by Candace Langan Design – also based in Newport – whose principal Candy Langan is Bill’s wife. Calliope was built at the Holland Jachtbouw shipyard, in the Netherlands. Her maiden voyage last summer to took her north to the fjords of Norway, and she can now be found cruising European waters for the summer. Based in Newport, Rhode Island, Langan Design Partners is an internationally recognized full-service naval architecture and yacht design office with the capacity to take on all aspects of the development of luxury yachts and commercial vessels from early concept to detailed engineering, incorporating 3D modeling, interior and exterior styling, performance and sea-keeping analysis.